Andhra Pradesh State Government, Released NTR Bharosa Pension (NBP) Details online through NBP official Website http://ntrbharosa.ap.gov.in/ . Andhra Pradesh People Who already applied NTR Bharosa Pension, applicant Check NTR Bharosa Pension Application Status online.After Elections New Andhra Pradesh State government has announced Old age Pension is know as " Vrudhapya Pension" has been increased to Rs. 1000/- , Physically Handicapped Pension is known as "Vikalangula Pension" has been increased 1500/- under NTR Bharosa Scheme. AP Govt NTR Bharosa Pensions List now available District wise details online, Applicant Check Gov Pension Status online, mandatory to Enter their Pension ID OR Aadhaar Card Number OR Ration Card OR SADAREM ID for get NTR Bhasona Pension Status online.This Facility avail all Districts of Andhra Pradesh(Anantapur,Chittoor,Gunder,Nellore,Kadapa,Krishna,Kurnool,Prakasam,Srikakulam,VisakaPatnam ,Vizianagaram,East Godavari,West Godavari ) online. About NTR Bharosa Pension (NBP) Scheme of Andhra Pradesh. The Government of Andhra Pradesh is committed to secure dignified life to all the poor and vulnerable, particularly the old and infirm and to support their minimum needs to bring happiness in their lives. In pursuit of this overarching goal, inspite of the challenging financial conditions, orders were issued vide G.O.Ms.No. 113 Dated: 19.06.2014 enhancing the NTR Bharosa Pension amount from Rs.200/- to Rs.1000/- per month to Old Age, Widow, Weavers,Toddy Tappers and AIDS patients and from Rs.500/- to Rs.1000/- per month to People With Disabilities (PWD) having 40% to 79% degree of disability and Rs.1500/- per month for PWDs having 80% and above degree of disability, and that the above enhanced scale of pension came into effect from 2nd October,2014 onwards. Eligibility of NTR Bharosa Pension Scheme . 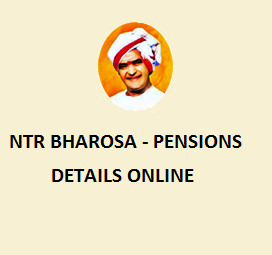 How to Search NTR Bharosa Pension Details online ? 8, Now Click on "Search" Button. టంగుటూరు గ్రామానికి చెందిన ఈ కింది వారు అన్ని విధాల అర్హులైనను పెన్షన్లు పొందలేక పోతున్నారు. బాధితులకు చెప్పబడుతున్న కారణాలు ఇక్కడ ఇస్తున్నాను. 2) కాలపల్లి నర్సమ్మ, 80 సం. క్రితంనుంచి లభిస్తూ వచ్చిన వృద్దాప్య పెన్షన్ ఆగి పోయింది. 3) పుట్టా కనకయ్య, 80 సం. 9) కొణికి వెంకట శేషయ్య, 85సం. ఒక్కొక్కరు 4,5 సార్లు అర్జీలు సమర్పించుకున్నారు. భార్యకు అభయ హస్తం పెన్షన్ లభిస్తున్న కారణంగా భర్తకు వృద్దాప్య పెన్షన్ మంజూరు చేయుట లేదు. జన్మ భూమి-మాఊరు గ్రామ కమిటీ ఫక్షన్స్ ఏమిటి?